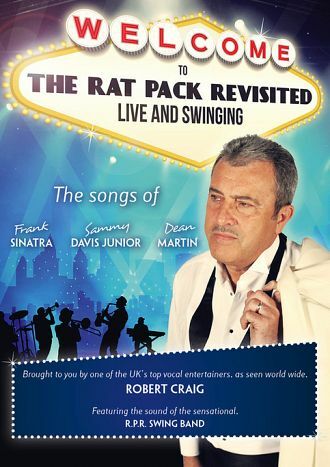 Mr Immaculate Robert Craig brings you his "Rat Pack Revisited" Show & transports you back the the Sands Venue on the Las Vegas strip. With a show covering all the classics from Frank, Sammy & Dean! Typical Set list: includes: Come Fly With Me, Who Can I Turn To? The Lady Is A Tramp, Sway, Ain’t That A Kick In The Head, It Was A Very Good Year, My Funny Valentine, Fly Me To The Moon, I’ve Got You Under My Skin, My Way, Night And Day, Hey There, I’ve Gotta Be Me, Luck Be A Lady, Come Back To Me, Mr Bojangles, That Old Black Magic, Crossroads Of Life, Birth Of The Blues, Candy Man, What Kind Of Fool Am I? That’s Amore, That’s Life, You Make Me Feel So Young, Strangers In The Night, Memories Are Made Of This, For Once In My Life, New York New York, Volare, My Kind Of Town, Little Ole Wine Drinker Me, Everybody Loves Somebody Sometime, One For My Baby, Didn’t We, I Get A Kick Out Of You, The Rhythm Of Life, Chicago, Mack The Knife.